CKN recently commenced a trial of the Natural and Alternative Treatments database. Some CKN users have experienced problems accessing the database, making it difficult for them to properly assess the suitability of the product. The publisher of the database is investigating the problem. We have decided to end the trial until the problem has been resolved, and will notify users when the trial recommences. Thank you for your patience. Embase has nine search forms: Quick, PICO, PV Wizard, Advanced, Drug, Disease, Device, Article and Authors. Earlier this year Embase introduced a new PV Wizard search form on their platform. The PV search form enables Embase users to build structured, comprehensive pharmacovigilance and literature monitoring search queries in an easy and fast manner. There are valuable resources available under eBooks’ on drug safety and prescribing during pregnancy. "Drugs During Pregnancy and Lactation: Treatment Options and Risk Assessment" is a ‘fast look up’ and ‘accessible’ text to provide advice on prescribing during pregnancy. Find this text under eBooks’ You can also find it here. The new 8th edition of Talley & O'Connor's Clinical Examination is now available on ClinicalKey. The book has been renamed from ‘Clinical Examination: A Systematic Guide to Physical Diagnosis’ to 'Talley & O'Connor's Clinical Examination’. This Call for Expressions of Interest will remain open for twenty-one (21) days and closes at 5:00 pm on Friday, 3 November 2017 (AEDT). A call by MIMS for Expressions of Interest to serve on the MIMS Honorary Advisory Board is now being made. MIMS is the leading supplier of trusted, quality, independent medicines information to Australian and New Zealand healthcare professionals. The ClinicalKey App is now avilable to CKN users. Leverage insights for better patient outcomes anytime, anywhere with the ClinicalKey mobile app – available for both Apple® and Android™ devices. ClinicalKey helps clinicians rapidly access evidence-based, peer reviewed information to improve speed to accurate diagnosis and treatment. CKN now provides access to The Red Book Online (RBO) Visual Library. The library includes more than 2,700 images related to infectious diseases for use in diagnosis and presentations, including clinical manifestations, disease vectors, and etiology. The images can also be downloaded as PowerPoint slides to include in your presentations. 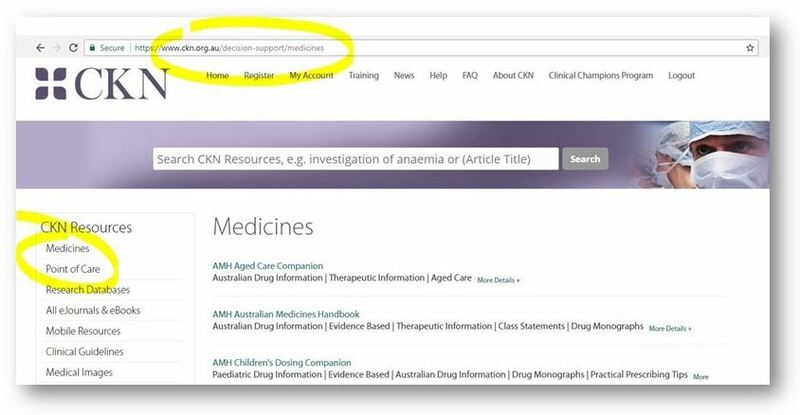 With CKN’s latest technical update you can now link directly to the Medicines, Point of Care, Research Databases and other resources pages in the side menu, using the page URL, e.g. https://www.ckn.org.au/decision-support/medicines. This is helpful if you want to include direct links to them when creating internal documents and guides, newsletters or emails. CKN users will have direct access to these pages while on site at their hospital, or they can simply access them by logging in with their CKN Account details if working at home or remotely. September is Sepsis Awareness Month. Marijke Vroomen Durning, Director of Content at Sepsis Alliance, authored the following blog post for BioMed Central about Sepsis and the importance of raising awareness.